The average auto insurance rates for a Volkswagen Jetta are $1,396 annually for full coverage. Comprehensive insurance costs an estimated $306, collision insurance costs $542, and liability costs around $390. Liability-only coverage costs as low as $452 a year, and high-risk coverage costs $3,014 or more. 16-year-old drivers cost the most to insure at up to $5,168 a year. Full coverage includes $500 comprehensive and collision deductibles, minimum liability limits, and includes UM/UIM and medical coverage. Prices are averaged for all states and for different Jetta trim levels. 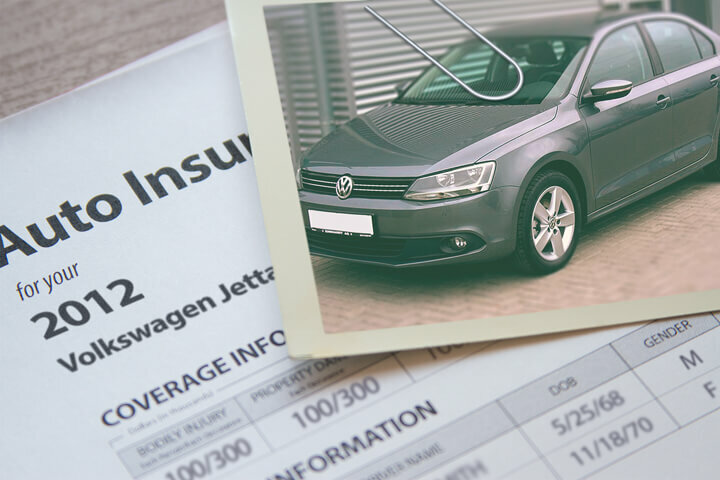 For a 40-year-old driver, Volkswagen Jetta insurance rates range from as cheap as $452 for a discount liability-only rate to a much higher rate of $3,014 for high-risk insurance. Where you live can have significant affects on insurance rates. More rural locations are shown to have fewer accident claims than congested cities. The price range example below illustrates how your location can change insurance prices. The examples above show why anyone shopping for car insurance should compare prices for a targeted area and their own personal driving habits, instead of using rate averages. 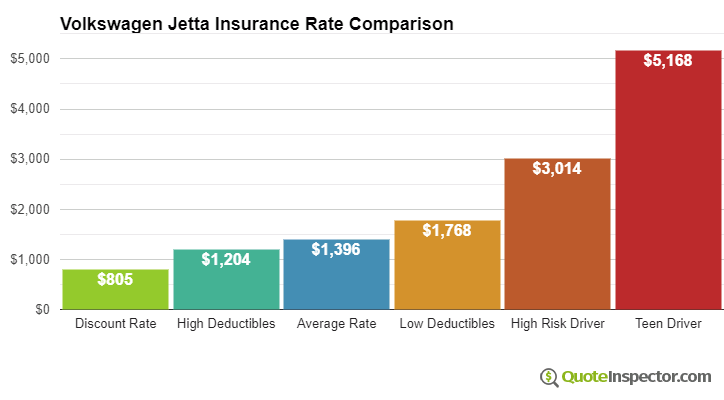 The chart below shows average Volkswagen Jetta insurance rates for other coverage scenarios. Insurance rates for a Volkswagen Jetta also range considerably based on the model year and trim level, your driver profile, and liability limits and deductibles. 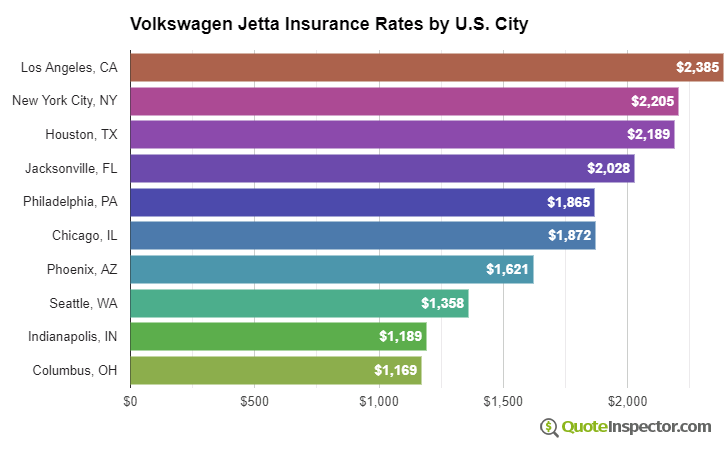 Your home state has a huge impact on Volkswagen Jetta insurance prices. A driver around age 40 might see rates as low as $920 a year in states like Iowa, Maine, and Idaho, or at least $1,990 on average in New York, Louisiana, and Michigan. Rates are averaged for all Volkswagen Jetta models and trim levels. Rates assume a 40-year-old male driver, full coverage with $500 deductibles, and a clean driving record. Finding cheaper rates on car insurance requires avoiding accidents and violations, having good credit, avoid buying unnecessary coverage, and possibly raising deductibles. Invest the time to shop around every couple of years by obtaining price quotes from direct carriers like Progressive, GEICO, and Esurance, and also from local exclusive and independent agents. The list below is a summary of the material that was illustrated above.